IBM eDiscovery Analyzer provides first-pass review and conceptual search and analysis of cases created by IBM eDiscovery Manager. IBM eDiscovery Analyzer provides first-pass review and conceptual search and analysis of cases created by IBM eDiscovery Manager. eDiscovery Analyzer optimizes your capacity for high-scale, high-volume analysis of electronically stored information (ESI) relating to legal cases. Empower your legal professionals and litigation support specialists to conduct early case assessments. Improve your ability to prepare for meet-and-confer discussions. 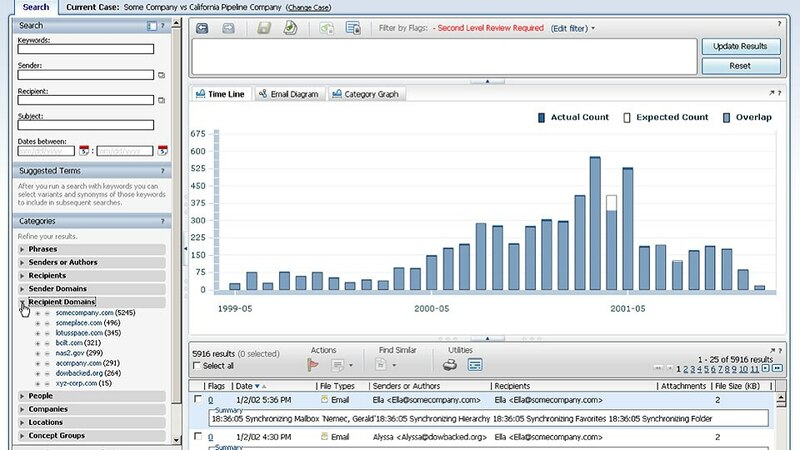 eDiscovery Analyzer provides a deep understanding of complex legal case evidence earlier. It enhances your overall ability to execute your case strategy while helping to reduce your own legal risks. Enables deep understanding of behavior patterns, content and conversations with visual evidence analysis to flag, tag and prioritize ESI earlier. Excludes non-responsive content from results. Provides conceptual search, content analysis, similarity and variant analysis. Adds near deduplication and visualization capabilities. Enhances your capacity to provide better security and exert more control over your electronic content. Improves your overall approach to litigation, investigation and audits.